1. How many passengers are sitting in the tuk-tuk? 2. How many passengers can you FIT in the tuk-tuk? 3. What do you think the tuk-tuk driver said? <---- This shall be the caption for the picture! 4. How fast do you think the tuk-tuk went? huh? what is this for? 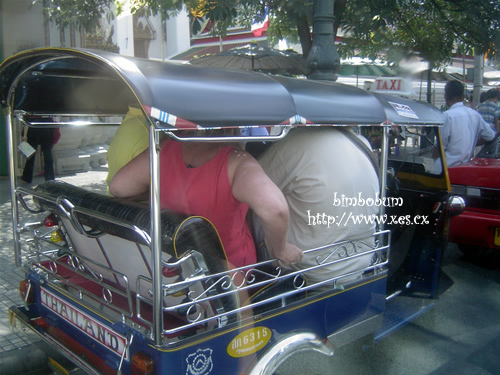 Tuk tuk has 5 peeple..
tuk tuk going 5 km/h with these 5 people..
tuk tuk driver said…..5 or 50, if u can fit, just sit! I see 3 ppl. I’d say 30kmph, because any faster he’d have trouble braking or the tuk tuk will turn turtle around the corner XD I’d say, 30USD? tuk tuk can go very fast even it is fully fitted with passngers. You should see it, to believe it! 4.the tuktuk could not move @ all. that tuktuk has 3 ppl. tuktuk supposed to be able to go at 10km/h oni, but with new engine can go at 15km/h. i’ve never sat in a tuk-tuk before ……. i’ve never even been to Bangkok! sniff.